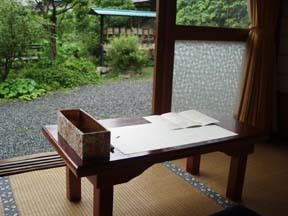 Temple Lodging in Japan "Syogaku-ji"
TEL 0429-79-0235 including 2 meals 6,500 yen. 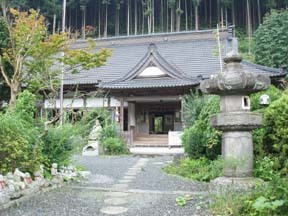 This is a temple surrounded by abundant nature in the mountains. They have succeeded the teaching of Dogen Zenji, the founder of the Sodoshu sect, on food. 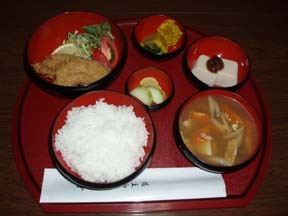 You are able to eat homemade shojin (vegetarian) food cooked under a nature-friendly policy. They also offer instructions on zazen practice and shakyo practice (copying sutra by hand). Many people who are seeking a chance for self-reflection and solutions for their problems visit this temple where anyone can experience a day of zen. 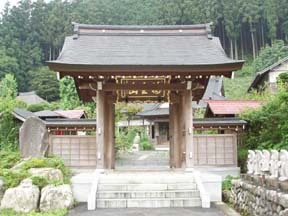 In front of the gate, there is a sign indicating that it is a zazen dojo (a practice hall) approved by the Sodo sect. After reception, you will be guided to the main hall, which is a pleasant open space. The accommodation place is separated by sliding screens from the main hall. Looking around, you will find mountains in all four directions. It is such a quiet world that it is the optimum surrounding to fully take in the natural air and practice zazen. I asked for zazen with accommodation. I started zazen at five in the evening. 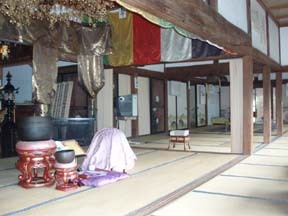 We learned Hanfukaza, the half-lotus position, with the left foot on right leg, Hokaijoin, a posture with the right hand placed underneath the left, with both hands forming an oval shape and how to receive keisaku (the bar with which you are hit on the shoulders during zazen) before we started. We started when the bell rung three times. 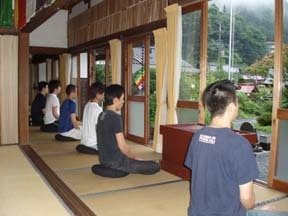 We practiced zazen facing the garden in front of the main hall. What surrounded us were the sounds of birds and a chorus of cicadas. I was fully enraptured (until my feet started to ache) by the beautiful natural sounds of the space. 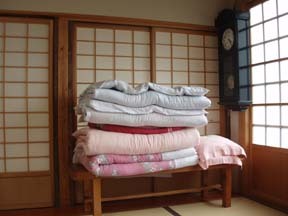 I joined the early morning zazen practice the next morning. On this occasion, I was facing the garden which was being hit by heavy rain; I felt calm while feeling the cool wind and listening to the sound of the rain. After evening zazen practice, yakuseki (dinner) is served. Meals are part of the training here. Before you eat, you say a phrase (Gokan-no-ge) expressing thanks for the food. The meal is served in the main hall. There are two warnings: one is to keep silent during the meal and the other is to always hold the dish when you eat food from it. In this way, you squarely face the meal and feel gratitude for food. At the end of the meal, put a slice of takuan (radish pickles) in a bowl. 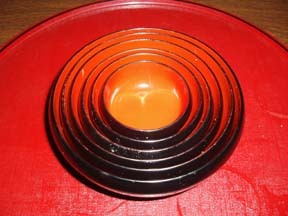 Pour warm water into the bowl, clean it with the slice of takuan and then move to the next bowl and repeat the procedure. In the end, drink the water and eat the takuan. This ends the meal. The dishes are organized so that they fit together perfectly when accumulated in the right order. This is worth seeing as it is something that shows the world of zen, which emphasizes rationality. They served dishes like sesame tofu topped with miso sauce, cooked pumpkin, deep fried gluten and salad, kenchin stew, a bowl of cooked rice and takuan (radish pickles). The deep fried gluten is served with a piece of lemon and you are supposed to squeeze the lemon juice over the gluten before you eat it. Many of us ate the lemon with its skin on (I did too)! A shukubo staff member laughed saying "I have never seen anyone eat a lemon completely." We probably did so because of the atmosphere in the temple, where people are grateful for everything. Even people who said that they didn't like pickles ate them all. A service was held at 5:00 the next morning. 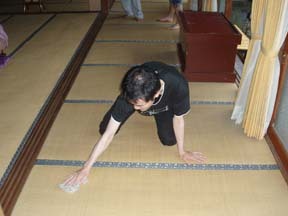 Everybody chanted the Heart Sutra, practiced zazen, listened to a sermon and fulfilled their duties (cleaning). I hear that the priest gives consultations during sermons, so people who come here with a problem end up talking with him for more than an hour. After that, breakfast was served. On this day, red bean porridge was served because there was a guest whose birthday was close. (A slice of melon was specially served for that person.) In the end, we practiced shakyo (copying sutra by hand) and left the temple. In this way, I was able to enjoy a day at a zen temple thanks to their instruction, which was kind and generous even for beginners.